You know how sometimes I use the existence of a Christmas episode to talk at length about the series it's part of? Yeah, this is definitely going to be one of those times. 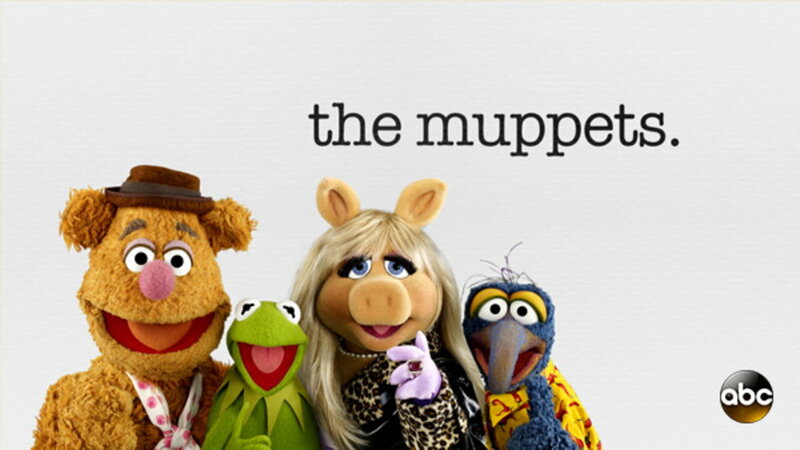 For decades, The Muppets have been severely hampered by their own past. The 70's series remains one of the television's all-time greatest series, their first movie was brilliant and whimsical, and their early Christmas specials are legendary. But for several decades, the franchise has lived in those shadows. At best, new productions offered a faithful homage to past successes; at worst, they were cheap cash grabs. This is true even of the specials I've loved - basically, anything after Henson passed felt it was retreading old ground. The 2011 movie deviated slightly by devoting some attention to considering the nature of the Muppets' relationship to their fictitious world, but by and large it was still more a tribute than a new chapter. Last year's series, however, was fresh and modern. Sure, it would be easy to point at this incarnation of The Muppets and dismiss it as a rehash of The Office, but it's worth noting that the Office's premise almost certainly owes a debt to the Muppet Show, which was essentially a parody of reality television, despite the fact it was several decades early. The new Muppets uses an updated framework of the original's premise, exploring its characters' lives now that they've matured and changed. It allows them to develop in more dimensions, treating them as complex, flawed individuals. They still have their quirks, but there's a touch of gravitas mixed into the hi-jinks. We still see bits of the show they produce, but this has clearly been pushed back to give the stories developing backstage more breathing room. In addition, the series is far more serialized than its predecessors: the central plot lines occur over the entire season. The Christmas episode is no exception. The holidays are used as a catalyst for characters to confront their feelings and to move the story forward. At the start, Fozzie's girlfriend has just broken up with him, leaving him too depressed to perform in their upcoming Christmas episode. Kermit tries to console him, but Fozzie can't take his advice seriously: he needs someone who understands what it's like to be dumped, but Kermit was the one who ended his relationship with Miss Piggy. This puts Piggy in the rare role of being more of an authority on emotion than her ex. Or at least she seems to be - she tries helping Fozzie using what helped her: material possessions. While he's not interested in stuff, she does cheer him up by pointing out the obvious fact he's been overlooking: he might be able to win his girlfriend back. He goes off and manages to do just that, but not before confronting Piggy with the question of why she didn't try harder to fight for Kermit. The episode partially resolves this by having Piggy and Kermit embrace as friends, but the realization that she let him go too easily that's planted in her mind here serves as a turning point for her character over the season-long arc. 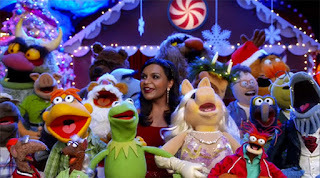 Beyond this, there are several B-plots: Yolanda has replaced everyone's name in the Secret Santa pool with her own, Mindy Kaling refuses to acknowledge she's a horrible singer, and Sam tries using mistletoe to steal a kiss from Janice. All of these are fun and do a good job integrating holiday tropes in ways that resolve in satisfying and in most cases surprising ways. In addition, Echosmith performs at the end, though it feels like more of an afterthought (sorry - the band was fine, but Kaling's willingness to embrace a caricature of herself was much more memorable). In addition to serving as a backdrop and catalyst, the holidays also permeate the tone, though they do so in a much more layered fashion than most Muppet Christmas fare. Because of the show's more mature premise, this embraces both the sweet aspects of Christmas and its more melancholy side. On its own, this episode was fun and amusing, but ultimately it's a piece in a much larger story that may be the most ambitious project centering around these characters ever produced. It's a shame more people couldn't appreciate this show - it really was something exceptional, even by Muppet standards. I have no reservations about slapping a "highly recommended" label on this review, but - like so many other great serialized shows we've looked at over the years - my suggestion is to start with the first episode and work your way through.